We’d love your help. 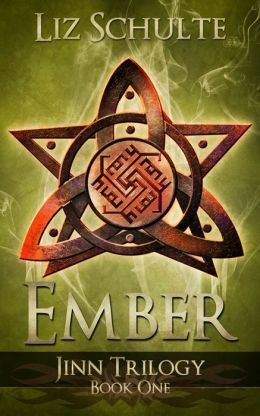 Let us know what’s wrong with this preview of Ember by Liz Schulte. But when Baker shows up beaten and bloody on their doorstep with a message, all hope evaporate Holden told Olivia it was only a matter of time before Hell came for them. After all, one doesn’t just walk away from the life he lived unscathed, but the longer Hell waited, the more Olivia let down her guard. She believed maybe happily ever after was possible—he knew it wasn’t. To ask other readers questions about Ember, please sign up. When the Guardian Trilogy ended, I wanted more. It didn't feel like Olivia and Holden were finished telling their story. Now I know why. This book is the start of a new trilogy where we will learn more about Holden and the rest of the Jinn and where Olivia will have to learn how to be herself and the angel hiding inside of her. In this book, we learn that Hell is ready to try to take control of both of them or destroy them. Having a free fallen angel roaming the world is bad for Hell's agenda. D When the Guardian Trilogy ended, I wanted more. It didn't feel like Olivia and Holden were finished telling their story. Now I know why. This book is the start of a new trilogy where we will learn more about Holden and the rest of the Jinn and where Olivia will have to learn how to be herself and the angel hiding inside of her. In this book, we learn that Hell is ready to try to take control of both of them or destroy them. Having a free fallen angel roaming the world is bad for Hell's agenda. Demons are looking for a weapon that will destroy Olivia. By destroying her, they will be able to get Holden's soul back for Hell. Jinn are slaves to Hell and having a free jinni is even worse than having a free angel. To top off the problems with Hell, Baker is dating Holden's only living relative, a human named Maggie. How will Baker tell Holden that he's been seeing her without getting himself killed? How will he be able to keep her from getting mixed up in everything going on with the Abyss? Being a human means she knows nothing about Jinn, angels, and whatever Baker really is. Can he bring her into their supernatural world without her going insane? The real question though is does he even want to? I thoroughly enjoyed reading this book and am really looking forward to finding out where everything is going to go. We learn even more about each of these characters, including the Sehkmet Femi. I really like Femi, as do a lot of people. I hope that eventually she gets her own book. I would love to learn about how she grew up to become a bounty hunter. Anyway...If you like supernatural books that don't revolve around one type of being, this is definitely for you, but I would definitely read The Guardian Trilogy first (Secrets, Choices, and Consequences). There are very few authors who can successfully spin a series off of a series and Liz can manage that masterfully. I love good versus evil stories; supernatural characters; and those that just continually leave you wanting more. Making you fall in love with characters, hate characters, cheer for them and more. Liz does this with her Guardian Trilogy and she also carries that same skill into this first book of the Jinn Trilogy. I love stories that weave different types of supernatural characters There are very few authors who can successfully spin a series off of a series and Liz can manage that masterfully. I love good versus evil stories; supernatural characters; and those that just continually leave you wanting more. Making you fall in love with characters, hate characters, cheer for them and more. Liz does this with her Guardian Trilogy and she also carries that same skill into this first book of the Jinn Trilogy. I love stories that weave different types of supernatural characters all together in one story. If you love Ember, go back and read the Guardian Trilogy. If you haven't read Ember, then you should probably start with the Guardian Trilogy. Enjoy! I really hate to have to wait for the next book! Once again Liz Schulte has written a great book! I love the characters and can't wait to see what happens next!! Cover/Title: I picked this book based on who the author was. The cover doesn't really give any idea of what the book is about. Neither does the name. Characters: I really enjoyed these characters. There is a lot to these characters and the reader only scrapes the surface in this book. Plot: Olivia and Holden realize their time is up. Hell as come after them finally. They race against time to figure out who their enemies are and how to stop them. Overall: I love the action in this book. There is Cover/Title: I picked this book based on who the author was. The cover doesn't really give any idea of what the book is about. Neither does the name. First off the cover is as intriguing as the book description. It is like a puzzle you are dying to unwrap or a chocolate awaiting to be devoured. This book is as good as eating chocolates! The story is amazing and the plot will keep you riveted til the end. Oh what an ending! Can't possibly wait for the next book in this series! It will be AMAZING!! HURRY UP AND GET HERE! I haven't read this author before but I will now and I will devour and read her books. I just love finding new authors to read!! Great read and better yet the characters are wonderful and interesting. Couldn't ask for a better supernatural read! Jinn, demons, Guardians, and angels ... oh and let's not forget Sehkmet and shifters too. Ember and the Jinn Trilogy as a whole are reads I'd been long awaiting ever since the end of the Guardian Trilogy. They both feature the same characters (Olivia, Holden, Femi, and Baker) along with some not so new faces. Hell strikes back, secrets run in abundance, and Olivia hears voices. It's a tantalizing intro into the new trilogy that left me craving more. I received a free copy of this novel in exchange for an honest review. Olivia is a fallen Angel in love with Holden, as freed Jinni. She thought they were finally free, even started to let her guard down. But Holden knew that eventually Hell would come after them. The battle begins when his best friend, a shape shifter, is returned to him battered with a message from the Jinn. Will Olivia merge with her Angel and be powerful enough to save them? Who is really after her? This book was an amazingly I received a free copy of this novel in exchange for an honest review. Olivia is a fallen Angel in love with Holden, as freed Jinni. She thought they were finally free, even started to let her guard down. But Holden knew that eventually Hell would come after them. The battle begins when his best friend, a shape shifter, is returned to him battered with a message from the Jinn. Will Olivia merge with her Angel and be powerful enough to save them? Who is really after her? I am so excited for more Holden and Olivia! The Jinn Trilogy is a continuation of the Guardian Series. I was so excited that we get more of Holden and Olivia's story. They are a very intriguing couple. They are characters a reader can't get enough of. Schulte has created such a believable world (the Abyss) and it is easy to get lost inside the pages of her books. Ember was a quick read and has me wanting the second book to find out what happens. Schulte is one of my favorite authors to read. If you I am so excited for more Holden and Olivia! Schulte is one of my favorite authors to read. If you haven't tried reading her books, you should pick up one. They are great. Secrets, Guardian Series book 1, is free on Amazon. I highly suggest picking it up and giving her books a try. You will not be disappointed. I love the way Liz writes and this book just keeps me reading more and more of her works. I really enjoyed this book and found that it was definitely had to put down. Took me a few chapters to get into the swing of the book - but once I was there, then there was no stopping me!!! The characters are explained well - and the way that things happen where they are living is fascinating!! Looking forward to the next book in the series!!! It was so great reading more about Holden and Olivia, after the guardian trilogy, I couldn't wait. And they are back, as good as always. Hell is sure trying to put a number on them again. I adored Baker, He has a great humor... Holden is in this book a bit wilder, more violent. Evil vs Good strong story and characters. Love it so much almost read it in one sit. Bring on the next Liz! I want to read more! Great book. This book is a continuation of Holden & Olivia's journey. This also explains when he characters in Easy Bake Coven need them why they are busy & only briefly pop in. The journey Holden & Olivia are on, Femi & Baker are with them. At this point I have no idea what is going to happen next but I am excited to read Inferno & find out. Loved the book! even through the missed proofing errors. I was pulled in from the first chapter and was drawn more and more to the last page. I just purchased "Inferno (The Jinn Trilogy Book 2) Kindle Edition" and am looking forward to my Jinn journey. I found myself not able to put this trilogy down. I loved every one of the books. I am totally loving this series. This author does a great job of blending all the different characters and stories together to create this world. Totally still intrigued by this book. It ultimately picked up where the guardian trilogy ended. I hope it doesn't take long for the second book to come out. Many authors claim to have known their calling from a young age. Liz Schulte, however, didn't always want to be an author. In fact, she had no clue. Liz wanted to be a veterinarian, then she wanted to be a lawyer, then she wanted to be a criminal profiler. In a valiant effort to keep from becoming Walter Mitty, Liz put pen to paper and began writing her first novel. It was at that moment she reali Many authors claim to have known their calling from a young age. Liz Schulte, however, didn't always want to be an author. In fact, she had no clue. Liz wanted to be a veterinarian, then she wanted to be a lawyer, then she wanted to be a criminal profiler. In a valiant effort to keep from becoming Walter Mitty, Liz put pen to paper and began writing her first novel. It was at that moment she realized this is what she was meant to do. As a scribe she could be all of those things and so much more.